Forest fire is nothing new to the Northern Rockies - all of the forests in this region have long-standing relationships with fire. However, the details of these relationships tend to differ among the various forest types. Each forest has a unique fire tale to tell. The pattern of fire occurrence typical of a given forest type and within a given place and time-frame is known as a fire regime. In reference to the Northern Rockies, the term historical fire regime generally encapsulates the frequency and severity typical of fires occurring within a forest type prior to the marked land-use changes of the mid 19th century and the advent of modern-day fire control measures. The characterization of historical fire regimes is crucial to our understanding of the long-standing ecological role of fire in northern Rocky Mountain forests. Comparisons of historic to contemporary fire regimes can reveal changes in patterns of fire occurrence that have important present-day ecological and socio-economic consequences. Knowledge of such changes, also known as departures from historical fire regimes, should underpin all forest restoration efforts underway today (Smith and Fischer 1997). Forests that experience fires of similar frequency and severity over time are said to have similar fire regimes. Fire sizes and burning patterns are additional components of fire regimes not included in a typical fire regime classification (Brown 1995). Fire severity tends to be inversely related to fire frequency. In other words, the more frequently a forest burns, the less severe the typical fire is apt to be. This relationship is emphasized in the fire regime classification. In the Northern Rockies, forests are generally categorized as having been subject to one of four historical fire regimes: (1) frequent, low-severity; (2) moderate-frequency, mixed-severity; (3) infrequent, mixed-severity; and (4) infrequent, high-severity fires. Frequent, low-severity fires are those that recur, on average, every 30 years or less, and kill less than 80% of the overstory trees each time (Brown 2000). These fires tend to carry through the forest understory and therefore do not substantially change the structure of the dominant forest vegetation. Moderate-frequency, mixed-severity fire regimes are characterized by fires with average fire-free intervals ranging from about 30 to 100 years (Arno et al. 2000), whereas infrequent, mixed-severity fire regimes are characterized by fires that recur at average intervals greater than 100 years. Mixed severity fires either cause selective mortality of dominant vegetation, depending on different tree species' susceptibility to fire, or vary between low and high severity in space or time (Brown 2000). Infrequent, high-severity fires tend to recur at intervals of 100 to 400 years in the northern Rocky Mountains. Few of the overstory trees (<20%, Brown 2000) survive most fires. By killing most overstory trees, such fires usually set the stage for the generation of new forests, which is why they are also commonly referred to as "stand-replacement" burns (Smith and Fischer 1997). 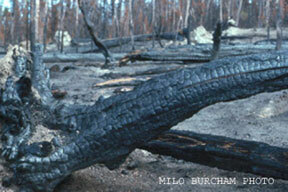 These fires often burn through tree crowns, leaving swaths of charred, standing dead trees in their wake. However, some fires that carry though the understory may kill a sufficient number of overstory trees to be considered high-severity. Typically these "lethal" understory fires kill trees by burning slowly or deep enough into the ground to damage tree roots or other crucial low tissue. As described in our earlier section on The Region's Forests, different tree species assume dominant roles in forests under different environmental conditions (e.g., temperature, rainfall levels). Some conditions are more conducive to fire (i.e., warm, dry conditions) and the species that tend to grow under these conditions are also the ones most likely to experience frequent fires. By categorizing our forests by the different environmental conditions they tend to experience, we have also grouped them, more or less, by fire regime. Click on the forest types below for general overviews of the fire regimes typical of each. Each summary is based on data describing patterns of fire occurrence during the two to five centuries leading up to the origin of fire suppression efforts in the region, circa 1910. Based on the coverage of each forest type and the typical patterns of fire occurrence in each, it is clear that most of the region's forests were shaped by mixed-severity fire regimes. Most of our forests developed with the potential to support crown fires in drought years, and most of the forest stands present in western Montana and northern Idaho today probably originated after stand-replacing fire events. In this way, the typical forest of the northern Rockies differs from that of the American Southwest. The most common forest type in Arizona, for example, would fit into our "Dry Montane" category and seldom supported high-severity crown fires in the past(Covington and Moore 1994). This distinction is an important one, because some of the recent national forest management recommendations have been heavily influenced by information on forest conditions ("forest health") in the southwestern U.S. (MacNeil 2000, Malakoff 2002). Clearly, fire management strategies and forest restoration protocols developed for southwestern ponderosa pine forests are applicable to just a small fraction of the forests of western Montana and northern Idaho, if at all. Agee, J. K. 1990. The historic role of fire in Pacific Northwest forests. Pp. 25-38 in J. D. Walstad, S. R. Radosevich, and D. V. Sandberg, editors, Natural and prescribed fire in Pacific Northwest forests. Oregon State University Press, Corvallis, Oregon. Arno, S. F., D. J. Parsons, and R. E. Keane. 2000. Mixed-severity fire regimes in the Northern Rocky Mountains: consequences of fire exclusion and options for the future. Pp. 225-232 in D. N. Cole, S. F. McCool, W. T. Borrie, J. O'Loughlin, compilers, Wilderness science in a time of change conference - Volume 5: wilderness ecosystems, threats and management. USDA Forest Service Rocky Mountain Research Station, Proceedings RMRS-P-15-VOL-5. Brown, J. K. 1995. Fire regimes and their relevance to ecosystem management. Pp. 171-178 in Proceedings of Society of American Foresters National Convention; 1994 Sept. 18-22; Anchorage, Alaska. Society of American Foresters, Bethesda, Maryland, USA. Brown, J. K. 2000. Introduction and fire regimes. Pp. 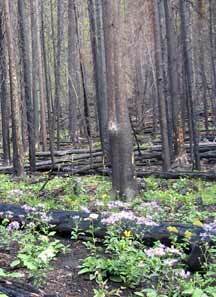 1-7 in Wildland fire in ecosystems: effect of fire on flora. USDA Forest Service Rocky Mountain Research Station, General Technical Report RMRS-GTR-42-VOL-2. Covington, W. W., and M. M. Moore. 1994. Southwestern ponderosa pine forest structure: changes since Euro-American settlement. Journal of Forestry 92:39-47. MacNeil, J. S. 2000. Forest fire plan kindles debate. Science 289:1448-1449. Malakoff, D. 2002. Arizona ecologist puts stamp on forest restoration debate. Science 297:2194-2196. Agee, J. K. 1997. Severe fire weather: too hot to handle? Northwest Science 71:153-156. Baker, W. L. 1989. Effect of scale and spatial heterogeneity on fire-interval distributions. Canadian Journal of Forestry. 19:700-706. Baker, W. L., and D. Ehle. 2001. Uncertainty in surface fire history: The case of ponderosa pine forests in Western United States. Canadian Journal of Forestry 31:1205-1226. Balling, R.C., Jr., G. A. Meyer, and S. G. Wells. 1992. Climate change in Yellowstone National Park: Is the drought-related risk of wildfires increasing? Climatic Change 22:34-35. Bessie, W. C., and E. A. Johnson. 1995. The relative importance of fuels and weather on fire behavior in subalpine forests. Ecology 76:747-762. Clark, J. S. 1989. Ecological disturbance as a renewal process: theory and application to fire history. Oikos 56:17-30. Fall, J. G. 1998. Reconstructing the historical frequency of fire: a modeling approach to developing and testing methods. Thesis. Simon Frasier University, British Colombia, Canada. Available online at http://www.rem.sfu.ca/pdf/jfall.pdf. Gardner, J.J., and C. Whitlock. 2001. Charcoal accumulation following a recent fire in the Cascade Range, northwestern USA, and its relevance for fire-history studies. The Holocene 11:541-549. Available online at http://geography.uoregon.edu/envchange/publications/jgardner/index.html. Heyerdahl, E.K, L. B. Brubaker, and J. K. Agee. 2002. Annual and decadal climate forcing on historical fire regimes in the interior Pacific Northwest, USA. The Holocene 12:597-604. Long, C.J., C. Whitlock, C. J. Bartlein, and S. H. Millspaugh. 1998. A 9000-year fire history from the Oregon coast range, based on a high-resolution charcoal study. Canadian Journal of Forest Research 28:774-787. Available online at http://geography.uoregon.edu/envchange/publications/crfirehist/index.html. Millspaugh, S.H., C. Whitlock, and P. J. Bartlein. 2000. Variations in fire frequency and climate over the past 17000 yr in central Yellowstone National Park. Geology 28:211-214. Available online at http://geography.uoregon.edu/envchange/publications/mwb2000/index.html. Mohr, J.A., C. Whitlock, and C. N. Skinner. 2000. Postglacial Vegetation and Fire History, Eastern Klamath Mountains, California, USA. The Holocene 10:587-601. Availble online at http://geography.uoregon.edu/envchange/publications/mwb2000/index.html. Swetnam, T. W. 2002. Fire and climate history in the western Americas from tree rings. PAGES News v.10 (1). Available online at http://tree.ltrr.arizona.edu/~tswetnam/tws-pdf/PAGES-TWS.pdf. Whitlock, C. 2001. Variations in Holocene fire frequency: a view from the western United States. Proceedings of the Royal Irish Academy 101B:65-77. Available online at http://www.ria.ie/publications/journals/procbi/2001/pb101i1-2/pdf/101b1206.pdf. Whitlock, C. and P. J. Bartlein. 1997. Vegetation and climate change in northwest America during the past 125 kyr. Nature 388:59-61. Available online at http://geography.uoregon.edu/envchange/publications/nature/nature.htm. Whitlock, C., A. M. Sarna-Wojcicki, P. J. Bartlein, and R. J. Nickmann. 2000. Environmental history and tephrostratigraphy at Carp Lake, southwestern Columbia Basin, Washington, USA. Palaeogeography, Palaeoclimatology, Palaeoecology, 155:7-29. Available online at http://geography.uoregon.edu/envchange/publications/carplake/index.html.